Immigrant and Refugee Health Series – Starting this September! 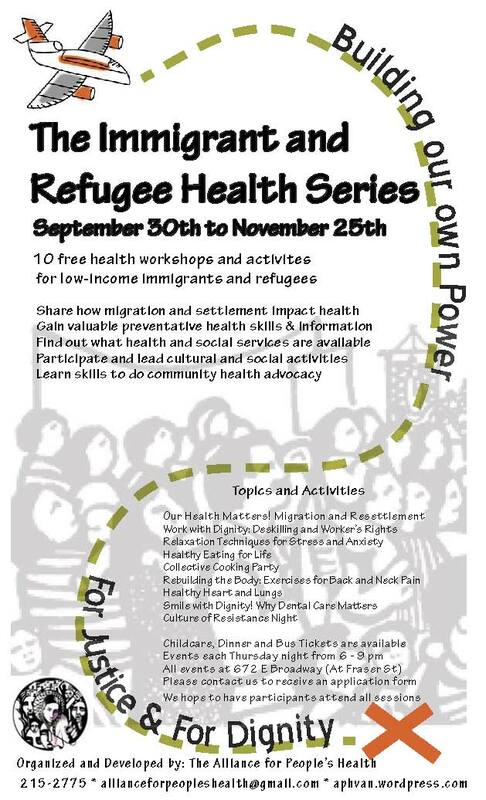 The Alliance for People’s Health is excited to announce the upcoming Immigrant and Refugee Health Series. This addition to the People’s Health Series has been long anticipated! We are NOW accepting applications! This new series runs for 9 consecutive Thursdays @ 6:30 pm, September 30 to November 25. Due to the high demand for the sessions and our need for consistent participation, we are requesting that people who want to join the series send us this very short APPLICATION FORM. We will be confirming all participants by September 16. Thursday September 30th: Our Health Matters! Managing our lives through migration, displacement, and resettlement. Rebuilding our lives in a diff erent country and culture can have huge impacts on our overall well-being. Share your experiences of health through migration and what health means to you. Learn about the common economic, political and social factors that lead to forced migration and displacement. Discuss the struggles we face to maintaining our health as immigrants and refugees and what we can do to make sure that our communities stay strong and healthy. personal growth. Come share your concerns, learn about your rights, and share strategies and resources for coping. Thursday October 14th: Free our Minds: Relaxation techniques for stress and anxiety. Share tips on how to manage stress and anxiety in your life. Learn relaxation techniques and other ways to cope with stress and anxiety. Discuss what are the roots of our stress and anxiety and what we share in common. Talk about what can we change as individuals and what can we change through collective action. Thursday October 21st: Healthy Eating for Life. The foods we consume are the building blocks of a healthy body, mind, and spirit. There are many reasons why we eat the way we do. Consider what we eat and why; what foods are important that we might be missing? What can we do to improve our diets without a lot of cost, and help prevent disease? Share tips and ideas for how to make the foods we eat healthier for life! Thursday October 28th: Collective Cooking Party. Help prepare and cook a collective meal to celebrate what we have learned together. Share some of your favorite recipes and learn new ones from other participants. Thursday November 4th: Rebuilding the Body: Exercises for Neck and Back Pain. Neck and back pain are the most common health complaints in Canada, especially for people who work low-wage and repetitive jobs. Instead of just taking medications which don’t fix the problem, exercise can be used to improve most conditions. Learn easy and practical exercises you can do at home to restore healthy posture and relieve pain. Thursday November 11th: Healthy Heart and Lungs. Heart disease, smoking and asthma are some of the biggest health problems in Canada. What makes our communities susceptible to these diseases and how can we prevent them? Discuss the roots of poor heart and lung health and how it starts from early childhood. Learn how to look for symptoms of common heart and lung diseases including hypertension, high cholestrol, asthma and pneumonia. Thursday November 18th: Smile With Dignity! Why Dental Care Matters. There are many reasons why our teeth are so important! Learn about the basics of taking care of your teeth and how to care for the teeth of the children in your family. Discuss as a group how lack of access to dental care impacts our communities. Learn about the “Smile With Dignity” Dental Campaign. Thursday November 25th: Culture of Resistance Night. To wrap up the Immigrant and Refugee Health Series, participants are invited to perform a piece of poetry, story, song, dance, skit or other creative form to express their hope and inspiration for achieving health in their lives and community. All workshops and events are held at 672 East Broadway (@ Fraser) in the Organizing Centre for Social and Economic Justice. Childcare is free, but you MUST let us know you’re bringing your kids so we are prepared to help look after them! We will have lights meals and snacks at every session, so don’t worry about dinner before you come! This series is not necessarily geared toward health sciences, nursing, midwifery, medicine, or other allied health students or professionals as participants per say. If you are interested in the series because you work in health care and are passionate about people’s health, consider becoming an APH Community Health Advocate and organizing for change! If you are interested in becoming a Community Health Advocate and Facilitator with the People’s Health Series – let us know! We provide the necessary training; you make the commitment to work with the Alliance for People’s Health for the improvement of health for all in our communities. Contact us for more information, but don’t delay!